Just how old am I? Your guess is as good as mine. Six weeks ago, if you had asked me how old I was (not that you would be so impolite, of course) I would have said 37. There would be no pause. No need to think about it. I was sure I was 37. 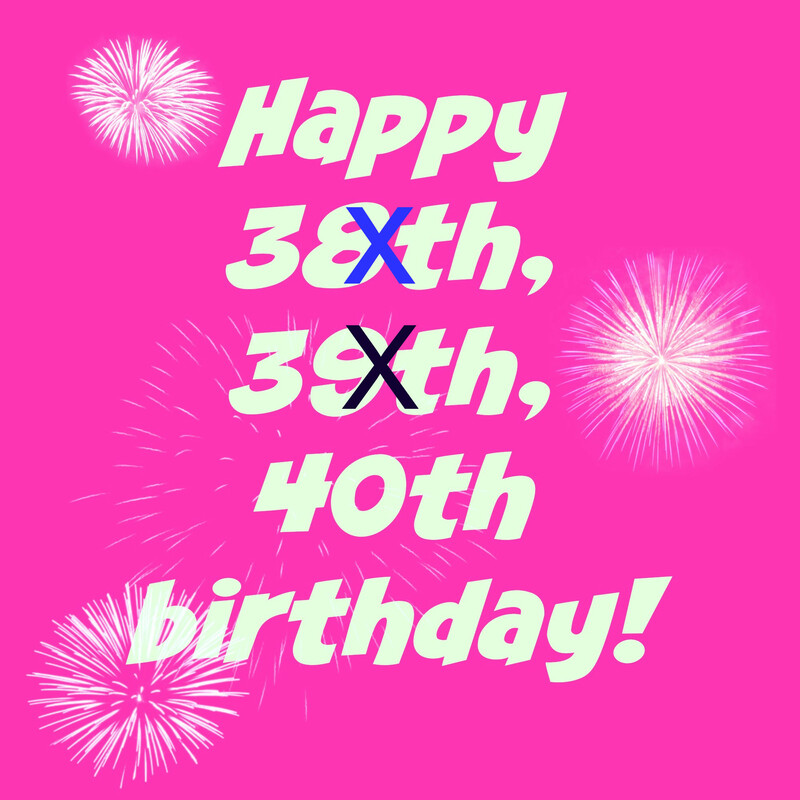 The realisation that, somehow, I have skipped an entire year of my life (I mean, yes, I’m tired but surely not that tired) came when a good friend, who is a month older than me, mentioned that we needed to start planning for our 40th. Hold on. If she is 40 next year then…am I? Initially, I was so sure that I was 37 that I even wondered whether she had been held back a year at school but since then more people have started to mention it. Just to be doubly certain, I got the calculator out and it seemed to suggest the same thing but I’m rubbish at maths so thought I could still have made a mistake. I am no longer 37. In fact, I am nearly 40 (ok, in a year and a bit). I’m not normally one for bothering about age. I didn’t go into melt down when I hit 25 or even 30 (although I did have a fabulous holiday in Turin to celebrate) but I think this is considered one of those special birthdays (at least if some of the things my friends are planning is anything to go by). I also came across a Tweet from Slummy Single Mummy who had created a 40 Things To Do Before I Am 40 list and had recently crossed “sending a message in a bottle” off (she even got a reply – although not quite the one she was hoping for). She then kindly sent me the link to her full list from 2013, which has some brilliant suggestions on there that I would never have thought of. It got me thinking that maybe I should write a list – although with so little time left it would have to be a short one and it would need to be things that were achievable with a toddler in tow and which didn’t require me to fly anywhere (how long does a boat take to get to New York?). I can’t work out whether the fact that I couldn’t really think of very many things was good or bad. Did it mean I was content or lacked ambition? The thing is, aside from the general things of being the best mum I can be, being good at my job etc there is really only one thing I want to achieve. I want to write a romance novel. Now, a bit like mummy blogging, writing (and reading) romance is often looked down upon, despite the genre regularly topping best-seller lists. It’s not everyone’s cup of tea, I get that, but I am a fan and writing one has been a long-term dream. The trouble is, writing fiction is a long way from my (part time) day job of writing news/features and I find it a challenge (although maybe that’s a good thing?). At the start of the year, one of the words from The Prompt was “beginnings”. I always mean to take part in that link up but this one in particular had my mind whirling into action (although I never got around to writing it). You see, I have the beginnings of so many stories in notebooks or filed on my laptop but they never actually go anywhere. I think the most I have written is about three chapters and then I stop and lose confidence in my writing ability and also where the story is going. But recently this 40th thing kept coming back to me. I’m a journalist. I love a deadline. In fact, I work better if there is a deadline so I decided I should look at my 40th as a deadline. I’m telling you this because then it makes it real. To get me started I discovered a competition in Prima magazine with Mills and Boon, the world’s largest publisher of romantic fiction. Readers are invited to submit an 800 word first chapter of a romantic novel (and a 1,000 word synopsis). The winner will get a publishing contract. I’m sure I have no chance of winning BUT this was the pre-deadline deadline. So the reason I haven’t been blogging as much is because when I haven’t been looking after Freya, working or sleeping, all my spare time has been put into writing my competition entry. So now my (digital) red pen is about to get a workout. Wish me luck! Do you have a bucket list? What’s your top to do? (Yes, I am trying to nick your ideas to add to my pitiful list, although I do have a bit of a plan forming. Maybe I could do 1 for me and 39 things for other people? Not sure how realistic that is but it’s something to think about). Previous post18 months on – things I know now that I wish I had known then. I keep meaning to write a list of things to do before November, but I just don’t get round to it, and time is getting short!! It is interesting how our 40th birthday are suddenly viewed totally differently to our 30th or even 25th. Suddenly we start to see life through ‘longer eyes’. We make bucket lists, and we plan things we must do because somehow it won’t be the same we do them when we pass 40! To this, I say, and I can say this, (as I AM past that magic age), to this I say 40 is the new 30! 50 is the new 40! So by my calculations, and I am another who is crap at maths), that means you have ten years and a little more to complete the ‘bucket’ list. But to the novel, I say do it, and do it as soon as you can! Having a deadline really will help. Good luck with it all and if your blog is anything to go by, it will be a great read!!! Even for a crime fiction reader like me! If I can be interested, there will be loads of others out there who will also be interested in what you write! So glad to hear you sent it off!!! Now we will cross our fingers for you! What a great achievement!!! Especially considering how life changes with a reflux baby.